She died at the age of twenty-seven. That in itself is a sad thing. That she probably died of a drug overdose doesn't bother me. It's part of a rock star's lifestyle. What's sad is that we will never be able to hear any new music from this promising new artist. If you don't think she's promising, let me just remind you that her 2006 album Back to Black made her the first British female to win five Grammys, including Best New Artist, Record of the Year, and Song of the Year. Your argument is invalid. 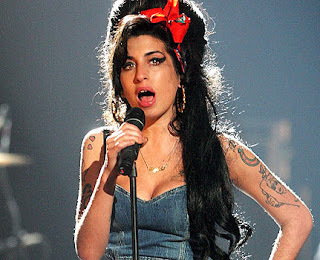 Amy Jade Winehouse. 14 September 1983 - 23 July 2011. Rest now my sweet Amy. The world can no longer hurt you.